1. Life waterproof: Not suitable for wearing in swimming or bathing. 2. We suggest users to use 5V/1A charger to charge. 3. Incorrect handling may cause device crashed. Please long press the power key for 15 seconds to restart. 4. The watch only support NANO SIM card. Please use the special screwdriver to open the watch back cover and make sure the shutdown state. Q: If I don't insert SIM card, but connect Bluetooth with my phone. Can I make or receive phonecalls? A：With a 460mAh battery, standby time for about 72H, continuous call time 3.5H after 2.5H full charged. We suggest customers turn off the lifting to light-on screen, GPS and Bluetooth if not use. Build-in precision heart rate sensor monitors the real-time heart rate changes in the movement, makes your workout more scientific and effective. DI07 can record steps, calories, speed, distance, and your goal completion for all workouts, help to adjust your exercise program. With Bluetooth connection, DI07 will sync to the phonebook with the phone and remind your calls, SMS, Twitter, Facebook, Wechat and other notification. DI07 supports music&camera control, you can also play the music in the watch memory. Alarm, Stopwatch, Recording, Gesture, Weather, Speaker, Microphone, Calendar, Clock, Find phone, Gallery, Browser, File Management, etc. Brand: Diggro (1 year warranty and friendly customer service). Advanced Configuration: Equipped with Android 5.1 MTK6580 1.1Ghz Quad Core Processor, be compatible for Android 5.0&iOS 9.0 or above, Bluetooth 4.0, RAM 512MB+ROM 8GB. Supports 3G NANO SIM Card, WLAN, Multi-language, Alloy case and 7.3-10.4inch adjustable TPU band. Dual Mode: You can switch 3G smart watch and smart band dual mode, free-3G smart watch also can long standby. Under Bracelet mode, the watch can only record the pedometer if you don't want to insert a sim card. Support 3G network: Support GSM 850 / 900 / 1800 / 1900; WCDMA 850/2100. 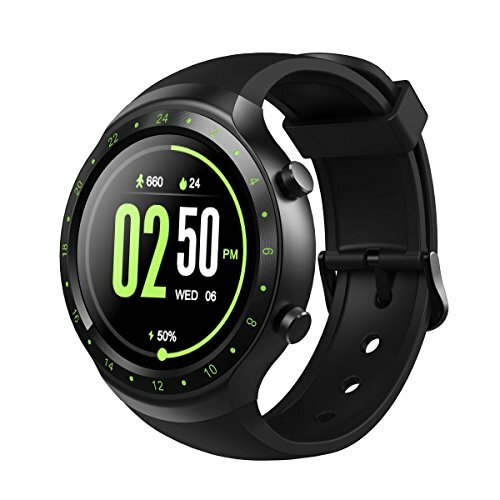 Built-in SIM card slot and independent 3G Calling model,after inserting the NANO SIM card, you can make calls, send the files, check Email, receive messages, and download APP from APP store on watch directly. Superb Design: 1.3 inch round full angle display, 3D cambered surface and tungsten steel material, especially fluorescent metal appearance, easy to read the watch. Multiple different styles of dial interface can be selected. Also you can download from the Internet.